Twelve, eleven, ten, nine! Teachers, students, and parents are chanting the countdown until school is out for the summer! That's right. For most schools, there are just twelve days left until summer. What are your summer vacation plans? 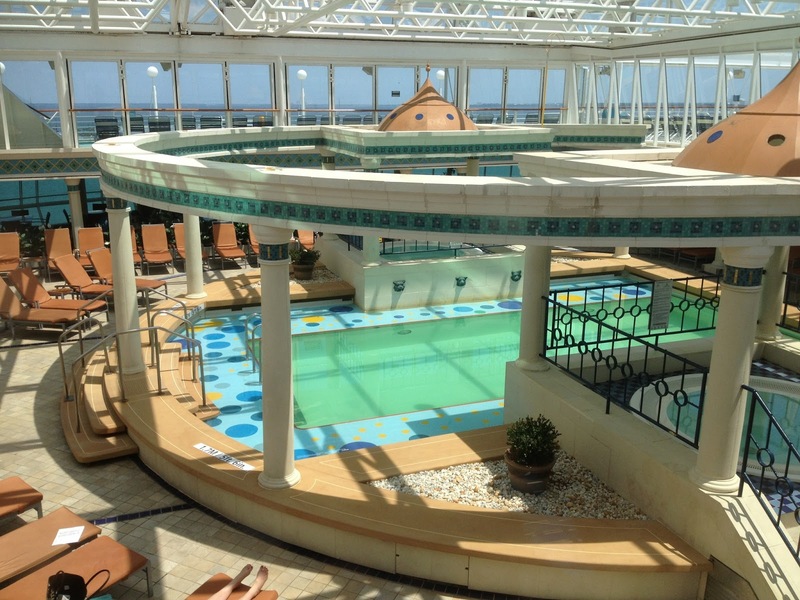 If you still haven't decided what your summer get-away will be, you should think about a cruise on Royal Caribbean's Enchantment of the Seas. In March, Enchantment of the Seas starting sailing out of Port Canaveral. Last week I had the opportunity to board Enchantment of the Seas and was very excited that we have such a beautiful ship sailing to the Bahamas with a stop at Coco Cay. Staterooms aboard the Enchantment are very spacious. 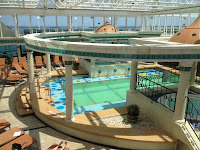 Pictured to the left is an ocean view stateroom on Deck 8. What a great view from the sit-in-window. Be aware that the ocean view staterooms on Deck 7 do not have the sit-in-window. If you are celebrating an extra special occasion on your 3-day escape, you have to stay in the Royal Suite (8514). I assure you, you will not be disappointed. This suite has a separate bedroom with a king size bed, private balcony, whirlpool bathtub, living room, a full size sofa and a baby grand piano. This stateroom definitely has the WOW factor and will make you feel like royalty. My Fair Lady is the main dining room. One of my favorite features of the dining room is the statue of Eliza Doolittle, from the musical My Fair Lady. Chops Grille steakhouse is the speciality dining option. For a low cover charge you can enjoy an eloquent dinner. Windjammer Cafe and Solarium Cafe are also available for other dining options. 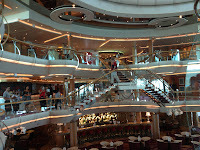 When we were on the ship, we noticed a room off to the side in the Windjammer that had speciality dining with Indian cuisine. Keep in mind that cruise ships do cater to different diets. If you have a special diet, be sure to let the cruise line know prior to sailing so accommodations can be made. Your summer get-away is calling you. School is almost out and Enchantment is ready for you! Get in touch with me today for additional information on your 2013 summer escape.